Evan Michael – my books. my life. So I had a baby on Saturday. And he is this amazingly perfect little boy that I am madly in love with. I may never accomplish anything ever again for all the staring. This post is incredibly long. But I want to share this birth story (and I want to share it now while it’s fresh in my memory) because it seems that most of the birth stories you hear are the awful ones. The marathon-length labors that end in c-sections anyway, the emergencies that always involve lots of blood, etc. This is what people like to tell you when you’re pregnant. It isn’t helpful and I did not appreciate it. My story isn’t like that. Sure, there are some less-than-pleasant details (not here – I will spare you), but they pale in comparison to the story as a whole. 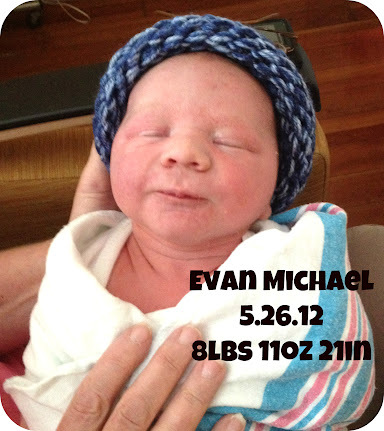 Evan came into this world in an amazingly calm and controlled way. I couldn’t really have planned it better if these were the sorts of things you could plan. I woke up at 2am on Saturday morning. I’d been crampy the last day and a half, which, looking back, was definitely early labor and contractions, but it wasn’t until 2am that I realized that this was definitely happening. The contractions were about a minute long but still 10-15 minutes apart. I got up, went downstairs so Ben could sleep, and read my book in between them. During each contraction, I just took deep breaths until it passed. Around 7am, they started coming more frequently (5-8 minutes apart). I stayed on the couch just watching tv (16 and Pregnant actually), and continued breathing through each contraction. They were uncomfortable, but I could talk through them. I’d been told not to come to the hospital until they were 4 minutes apart for at least an hour. So I stayed home. I continued this all morning. At 12:30, my water broke. I wasn’t really expecting the gush of fluid that I heard only a small percentage of women experience, but that’s what I got (and thank goodness this didn’t happen anywhere but at my house). So we grabbed our things (which we had packed earlier that morning) and headed to the hospital. I got to the hospital (despite all of the beach traffic trying to keep us away) and had to wait for a few other people to be admitted first. No one seemed to be in too great a rush, so I patiently waited. When the nurse finally checked me, I was 9cm! She actually didn’t believe it – she said I was way too calm – and had someone else check before calling the midwife. But I was almost ready to have him and they told me to let them know when I was ready to push. My favorite midwife was on call, which I am so very thankful for. She was fantastic. I was kind of waiting for my mom, so I continued to just hang out, but at some point I felt like I was ready to push. And, with timing that could have been scripted, by mom walked in during my first push. I tried to use the Hypnobirthing “breathing down” method rather than actually pushing, but after a few attempts I gave in to the pressure (both physical and peer) and really started pushing. Although I tried to breathe during it rather than holding my breath like they instructed me to. I pushed for an hour. And this was the most frustrating part of the process. They kept telling me the next one was it, so when it wasn’t, I was disappointed. But my midwife let me control the process. I pushed when I wanted to, and I even sat out a few contractions when I felt I didn’t have the energy. Ben was amazing. He just kept talking to me and encouraging me and I was able to focus on him when I was frustrated by the others. And at 4:34 pm, with all of the strength I had left, Evan Michael was born. And he is just perfect. Everyone says I did amazing and genuinely seemed impressed with me. I have nothing to compare it to and it didn’t make sense to me to go in with anything but calm and control. It’s really as simple as that. I knew I didn’t want drugs so I never even considered asking for them. I do credit my Hypnobirthing classes for giving me the knowledge and confidence that I could do this naturally and without fear. I didn’t really end up utilizing the techniques during my labor or delivery other than the breathing, but the preparation I got from the course was incredibly helpful. I highly recommend it as a natural childbirth method. So that’s my story. I know I’ve been plenty vocal about my pregnancy complaints (and I’m sure you’re all ready for those complaints to stop), but there is very little I would change about Evan’s birth. And I think I’d choose an “easy” birth over an “easy” pregnancy. Evan is so calm and perfect and I like to think that the way we brought him into the world has something to do with it. Thank you everyone who left me a kind message on twitter and facebook. All three of us are doing well and we appreciate all of the support – even the virtual kind. Oh, I was beyond sleeping through them too, but they’d already kept me up half of the previous night, so I slept for 4 minutes or so between each of them. I got teary eyed reading the part about how your mom got there just in time. I’m so happy for you that she did. Wow, what a birth story to share! You’re right, we tend to hear about the awful experiences more. It’s refreshing to know about a positive one. That is amazing. Lucky you! I’m so glad you had a good experience and that you’ve decided to share it! As you said, people tend to tell awful birth stories more…and I think it’s sad. Congrats on your baby! Evan is so cute! I LOVE that your mom made it there just in time. That is perfect. How wonderful. And I love the name! Can’t wait to see how things progress from here. What a crazy ride! I got all choked up reading this post! Congratulations to you. Evan is gorgeous! 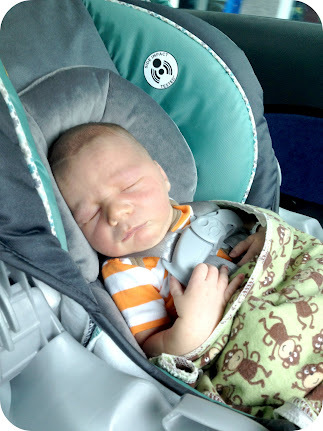 Your birth story is a dream, and I’m happy to hear Evan is calm and all is well. I kept Kevin up all night when my labor started with Nick. We wound up,at hospital at 4am and only 4cm but he was born just after 9am. Congrats again and looking forward to many more pictures. Oh, I am so glad he’s finally here, and that your labor was not terribly difficult and painful! I have a friend who is a midwife, and she is one of the most compassionate and caring individuals I know, so I think you did the right thing by choosing to work with one. He’s a beautiful baby, and I hope that you are resting comfortably with him in your arms, just gazing at all the wonderfulness. Congratulations to you and Ben, and welcome, Evan! Awwww, he’s perfect!! So adorable! And you’re right… it is a totally normal name, hehe. Congratulations! He is gorgeous, and you are amazing! I seriously teared up when you said your mom walked through the door just in time. What a wonderful birth story! You are like the poster child of motherhood! I am so proud of you, and impressed that you were so calm! I was not, but neither did I think the experience was horrific either. Hey, look at the payoff! He is gorgeous, so gorgeous. It was funny, but my water broke at the doctor’s office at one of my weekly checkups. It doesn’t get any more convenient than that, with the exception of having it happen at home. I was terrified it was going to happen like in the work cafeteria or something! Ha! Welcome to a new reader in this world, plus he is so very cuuuuuuuuute. Huge congrats to you! I haven’t had any kids yet, so I’m in awe of women who go through labor. What a beautiful birth story, Michelle. Thank you for sharing your experience. It’s so important for other first time Moms to hear how wonderful it can really be. Also glad to hear you now get to reap the benefits of a peaceful, happy baby! Pingback: Top Posts of 2012 | my books. my life. Pingback: Welcome, Kai. | my books. my life.